The Union Home Minister, Shri Rajnath Singh chairing a review meeting with the Directors-General (DGs) of Central Armed Police Forces (CAPFs), in New Delhi on August 03, 2017. The Ministers of State for Home Affairs, Shri Hansraj Gangaram Ahir & Shri Kiren Rijiju and senior officers of MHA are also seen. 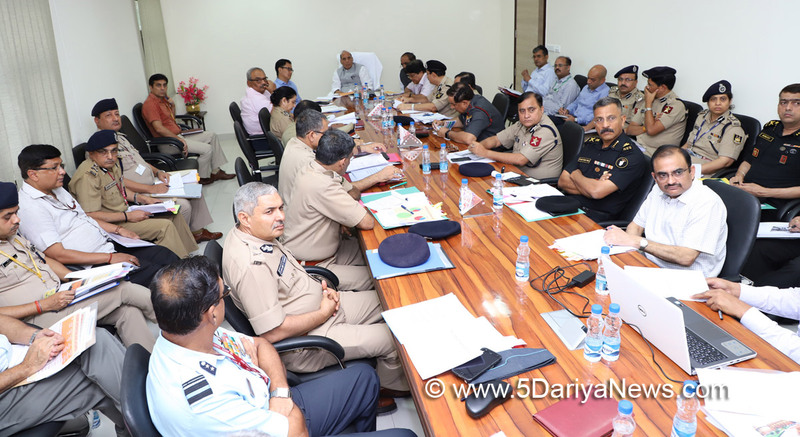 The Union Home Minister Rajnath Singh chaired a review meeting with the Directors-General (DGs) of Central Armed Police Forces (CAPFs) here today. The Ministers of State for Home Affairs Hansraj Gangaram Ahir and Kiren Rijiju were also present in the meeting.During the meeting, various issues related to the CAPF personnel and policies were discussed.The issues discussed included housing issues related to CAPF personnel, recruitment and filling up of vacancies, shortage of doctors in CAPFs, proposal for raising new Central Armed Police Force viz. Coastal Border Police Force (CBPF), setting up of CAPFs Institute of Medical Sciences, cadre review of the forces, review of BSF Air Wing and issues related to procurement of items by CAPFs.Shri Rajnath Singh expressed happiness on the progress achieved by CAPFs on different issues discussed in the meeting and said that efforts shall be made to complete the pending projects in a timely manner. He said that the Ministry of Home Affairs will look into the matters raised by the forces and try to do best possible in each case. Keeping in view the need of having young personnel on field job, the Home Minister asked the CAPFs to take necessary steps in this regard.The Union Home Secretary Shri Rajiv Mehrishi, DGs of CAPFs (CRPF, CISF, BSF, AR, SSB, ITBP, NSG) and senior officers of Ministry of Home Affairs were present in the meeting.